As a young Christian, I remember having to stand up and quote a Bible verse in our youth group. 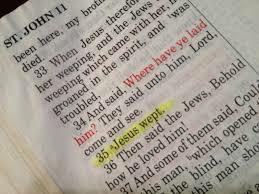 Of course, the one verse that many quoted first (before it got used) was John 11:35, “Jesus wept”. This was a favorite, because it is the shortest verse in the Bible. It would be many years later before I really appreciated the substance of those two words. In fact, the scriptures record only two instances in his earthly ministry in which Jesus wept. This appears to be the first in chronology, and the second time was when Jesus wept over the city of Jerusalem. In this study, I want to consider the context of both of these events. Were the Jews correct in their thoughts about why Jesus wept? Was it really because of Jesus’ close friendship with Lazarus? Was it because Jesus’ heart was aching due to his grief over the death of his friend? Why do people today weep over the death of their friends or loved ones? It is because they know that they will never again, on this earth, be able to fellowship or enjoy the company of that person whom they loved. This was not the situation here. Before Jesus even began his journey to Bethany, he knew that he would raise Lazarus from the grave. In fact, even after he received the news that Lazarus was sick, he deliberately lingered for an additional two days. Let us look more closely at this passage, so that, we may better understand the why of these two words “Jesus wept”. Sometimes the force or impact of a word gets lost in the translation. The Greek word, which is translated as “groaned”, definitely fits into this category. The transliterated word is embrimaomai. According to Strong’s Exhaustive Concordance, the word means “to snort with anger.” Thayer’s Greek-English Lexicon explains the term as “to be very angry.” The passage further states that Jesus was “troubled.” What is evoking these strong emotions that our Lord is experiencing at this time? As already pointed out, Jesus knew what was about to happen. Lazarus would be raised from the dead. To find the answer to the question, we must start at the very beginning of the history of mankind. After God placed Adam and Eve in the garden east of Eden, Satan came and lied to Eve. That is why Jesus referred to him as a “liar, and the father of it.” It was here, in the garden, where mankind spiritually died. Again, this is why Jesus said that Satan was a “murderer from the beginning.” Jesus places all the woes of humanity at the feet of the Evil One. It is Satan to whom Jesus is directing his anger, not to anything or anyone else. This is in accord with the judgment pronounced upon Satan and upon Eve (actually upon humanity). The word enmity is a strong word. It literally means hatred. This is why Jesus, during his earthly ministry, despised the religious leaders of his day. He once accused the Pharisees of doing “the deeds of your father.” Of course, this is in reference to Satan. Although Satan might initially have experienced envy or jealousy toward God’s newest creation, God would now cause that to be turned into hatred. This is reminiscent of the passage in 2 Thessalonians 2:11 where God would “send them strong delusion” to those who rejected the truth. From that moment on, there has existed a struggle between good and evil. In Revelation 12:17, we find this conflict illustrated for us. In this passage, Satan hates both the Jews and the Christians. He hated the Jewish people because through them (the woman) came forth “the child” (Jesus) who would render the deathly blow to the head of the serpent, Satan. So, as is evident from what we have studied, Jesus wept because of the grief caused by Satan upon a suffering humanity. Now, we will consider the second time that the scriptures record that Jesus wept. The time context is found within the last week of Jesus’ life before he offered himself to be crucified. He had made his descent from the mount of Olives and, most probably, was ascending as Luke describes this incident. Undoubtedly, Jesus stopped for a few moments as he looked up at this ancient city of Jerusalem. The scriptures leave us no doubt as to why Jesus wept. No, he did not shed his tears in the garden of Gethsemane where he agonized. Instead, he saved them all for us. It was because of his unfathomable love which he had for mankind. A love which is totally incomprehensible. The love of God is greater far, Than tongue or pen can ever tell. The guilty pair, bowed down with care, God gave His Son to win. Could we with ink the ocean fill, And were the skies of parchment made. Were every stalk on earth a quill, And every man a scribe by trade.